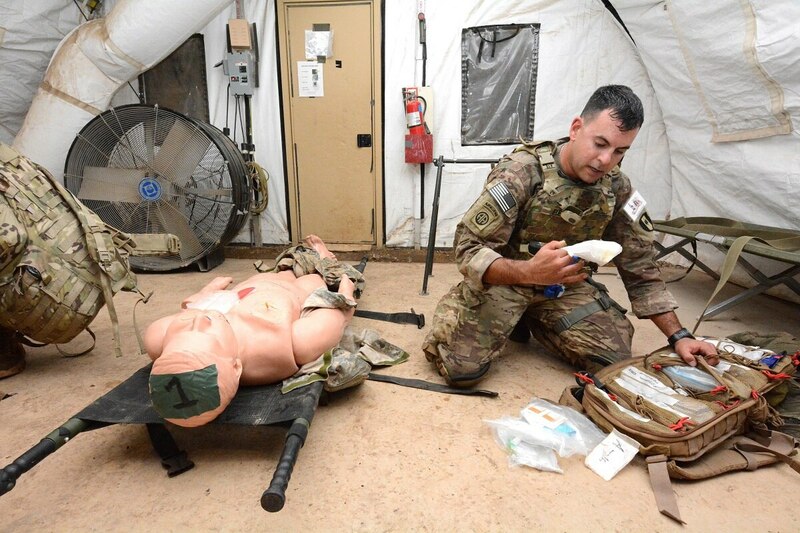 The Army’s 2018 Best Medic Competition came to a close Thursday, and two noncommissioned officers from the 1st Armored Division came out on top. Staff Sgts. Cory Glasgow and Branden Mettura are the Army’s top medics, according to Army Medical Command. Congratulations to Staff Sgt. Cory Glasgow and Staff Sgt. Branden Mettura of 1st Armored Division. You ARE the U.S. Army #BestMedic! The 75th Ranger Regiment’s Capt. Michael Broussard and Staff Sgt. Sean Collins clinched second place, and Sgts. 1st Class Adam Church and David Nagle of the the Army Medical Department Center and School came in third. Spc. Spenser Li uses his off-duty time to help search and rescue teams and teach rock climbing to kids with disabilities. The competition kicked off Monday at Joint Base San Antonio, Texas, with 27 two-soldier teams completing the new Army Combat Fitness Test before moving on to range qualification, an obstacle course, a ruck march and more. This marked the first time the ACFT has been fully implemented into an Army-wide competition since its development and announcement earlier this year. Over the course of the grueling 72-hour competition, the soldiers were tested in the areas of tactical marksmanship, leadership, warrior skills, land navigation and overall knowledge of medical, technical and tactical tasks.